Yesterday's post explained my version of the history behind Homecoming mums. 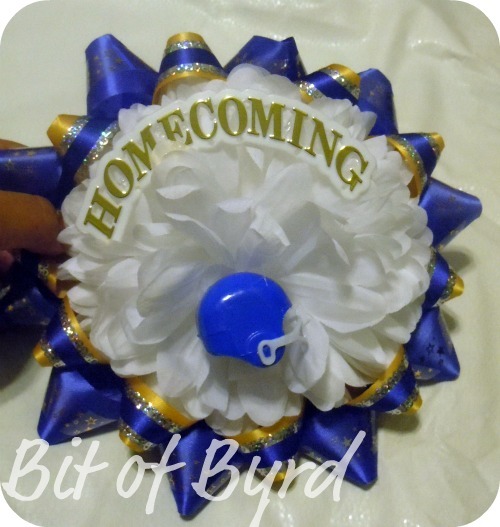 Today's post is the first to get into the construction or how to build or make a Homecoming Mum. The first part to create is the backing, that is where the flower is attached. This is also what get attached to all the ribbon that hangs in the end. Before we get too far into this, you might be wondering what supplies you need. Michael's does a great job of giving you a basic list. They are also the store where I buy most of my Homecoming mum supplies. Mostly because of their large selection of trinkets and their specialty ribbons. Something that cannot be stressed enough... you need a stapler and LOTS of staples! And a hot glue gun! Those are essentials. I like using a little stapler over a large one because it can get between the ribbons better. 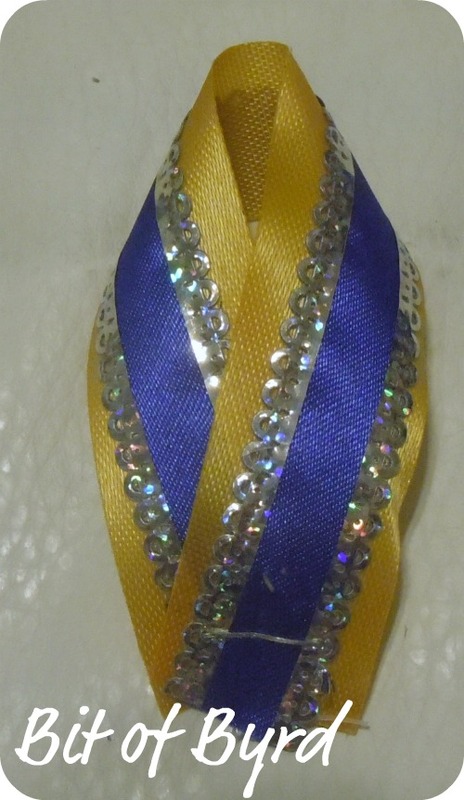 Many ribbons can seem kind of plan, so I dress them up with an accent ribbon. 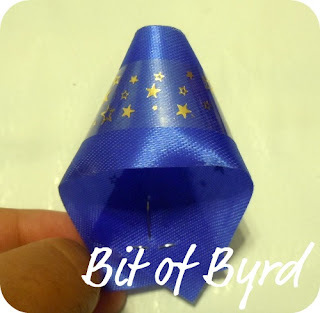 In this case I used a clear ribbon with gold stars on it. 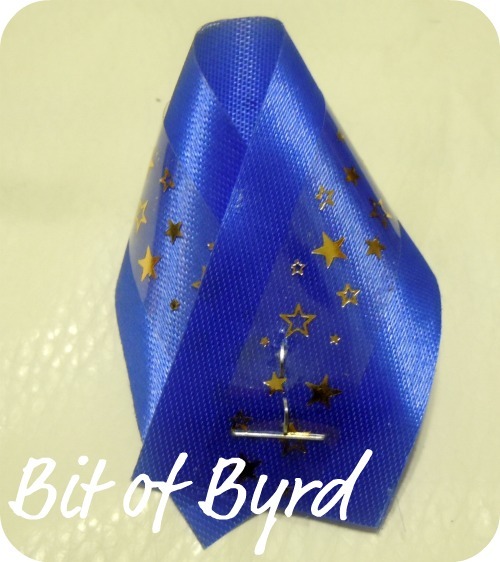 Each piece of ribbon before folded is about 4-5 inches long. 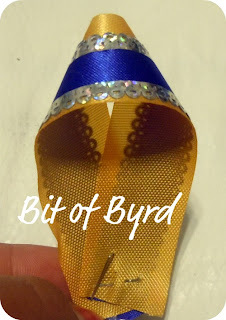 I choose to staple together the accent and main ribbon first, then fold the ribbon over and then staple them together. You can make the point as defined or open as you like. I make all one color ribbon pieces and then I staple them onto the backing. The backing can be purchased... but it is really just a piece of poster board. The key is to pick the size you want based on the size of the mum you purchase. There are single, double, and triples at the store. You can make any shape. 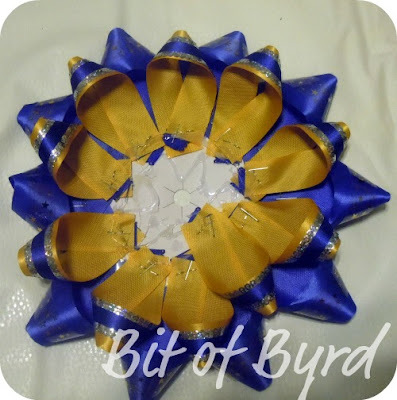 You just have to have a hole in the backing for the mum and you need 4 backing pieces 3 backings for a mum that all match and 4 backings for a garter that all match. I stapled the blue down and then filled in the between space with the yellows. You then cover everything in the middle with hot glue... act fast. You then insert your mum to the middle and press down. Make sure your mum stem comes through the hole in the center of your backing. This is the easiest part that allows the most creativity and freedom in my opinion. At the end of the series I will show you other ways to complete the ribbon backing and ways to enhance it. Have you made a mum before? Email me a picture so I can add it. Do you have any questions about my instructions? Let me know!